In this case it was for the bound buttonholes of my teal mohair jacket, where I wanted the pile to be consistent down the front. This trick takes only seconds at the cutting stage and prevents any uncertainty later on. No excuses not to really! So you have set in a sleeve and it looks amazing so far – but how do you actually press it? I press mine from the inside of the armhole, using only the tip of the iron. Move around the armhole bit by bit, maneuvering the fabric round, pressing just enough to meld the stitching and the eased fabric at the sleeve head. Now turn to the right side and admire the difference! When you need to measure a curve on your pattern, flip the tape measure onto its side and place it on the line. Even if I did own a flexicurve, I’d still use a tape measure because it is always at my fingertips. You can have too many tools! When sewing an invisible zip through horizontal seams, like a yoke seam, it is important that they line up when the zip is finished. To ensure this happens, sew one side of the zip, then zip it up and mark the position of the horizontal seam. Now mark the same position on the opposite side of the zip. In this example I nicked the zip tape, but you could use pins or chalk. When you sew the opposite side, ensure the mark matches the horizontal seam and everything will be sorted! I hope you enjoyed this month’s tips, and that you all have a great holiday sewing season! I have a lot of sewing planned, but I also plan on catching some sunshine so may not achieve it all – I’ll play things by air as usual. What are your holiday sewing goals? We are in cool season here and it is raining this week, a boon for southern Arizona, so not much sun. But we are going out to the the desert on Sunday for our annual Christmas Day bratwurst fest. In the meantime I’ve got some Christmasy pillowcases to sew, a new Louise Cutting shirt pattern to cut out and a Style Arc pant pattern to muslin so I will be busy. Enjoy your sunny Christmas and your refurbished machine. You are going to be busy! I hope your Christmas was lovelyTheresa! Merry Christmas to you, my antipodal and electronic friend! Thanks for these very helpful tips/reminders. Thank you LinB! I’m too late to say Merry Christmas now, so Happy New Year instead! Great tips – especially the one about the marking the invisible zip at the join of the yoke! This one I know I will use for sure. I always baste the zip when I have a yoke to deal with but it would be that added insurance to mark it as well. Also that tutorial of yours for vents on a jacket is brilliant. There was an article last month in Threads magazine on making vents too if it’s not included in your pattern. I love vents on all coats actually they make it much more comfortable for moving your arms and I think they extend the life of your jacket too. Glad you enjoyed them! Once the pattern is correct, jacket sleeve vents have only three extra sewing steps than a sleeve without a vent – no excuses really! Thanks for the tips! Merry Christmas to you 🙂 I hope to get some sewing done in January. I do desperately need some work clothes and casual tops. Best wishes to you Vicki! I need more basics too, and things to wear to work as I was starting to struggle in the mornings – just as well I am on holiday! Thanks Sheryll for all your tips on sewing. Wishing you a Merry Christmas and a fantastic 2017! Thanks so much Evelyne! Have a wonderful holiday season yourself! 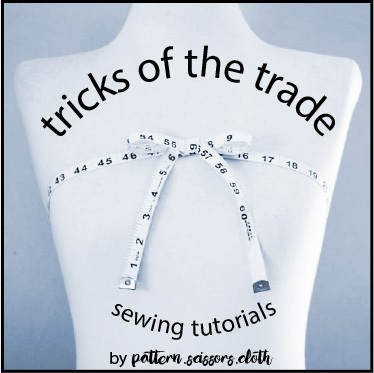 Great tips and standing your tape measure on its edge, needs to be on the stitching line if your patterns have seam allowance. Have a great festive season too Sharon! Allways looking forward to see your tips. Thank you Lillian for letting me know – it’s fixed now! Hi Sheryll, I’m so pleased that you left a comment on my blog, because somehow I missed your transition to this new location. It must of happened when I was busy and not reading blogs. Now I have a lovely lot of your posts to catch up on. Merry Christmas! Hope you had a great Christmas too Katherine! I totally understand, when I’m busy it is so hard keeping up with reading and commenting, let alone blogging! Thanks Sarah – and Happy New Year! Just reading one post of your monthly tips has given me more than a year’s worth of somebody’s weekly “Snippets”. Thank you for these informative posts, and Merry Christmas! Best Wishes to you too Jo! I’m glad you are finding them worthwhile! These are really great tips! I was just thinking today I really should cut on the wrong side of my fabric because my pieces would already be right sides together, haha! Mmmm hmmm… I love tailored sleeve vents. My first attempt at them was with an Ungaro design in the 90s with Vogue Patterns’ instructions, and they turned out brilliantly. But I chalk that up to the excellent drafting and instructions of the pattern. And I will try your tip for pressing a sleeve. I usually just steam mine into shape, ‘specially on tailored garments. Love these monthly tips! Have a wonderful holiday!